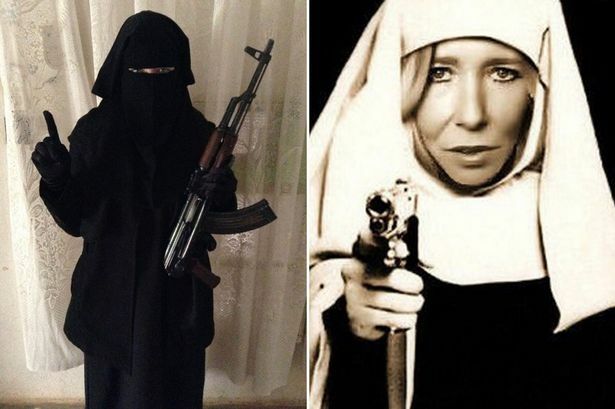 ISIS widow Sally Jones desperately wants to return home to the UK  but cant because leaders of the terror group wont let her go, according to a new report. After marrying her ISIS hubby Junaid Hussain, Jones became a top terror recruiter in Raqqa, Syria, and was implicated in two plots to kill innocent Americans. But since Hussain was killed by a US drone in 2015, Jones has been hiding out in hopes of one day returning home to Kent, England. She lost her husband in a battle last year. She has one boy, Aisha added, referring to Jones 12-year-old son, a child fighter who is believed to carry out executions. Awe the little brat punker that hated her country is now homesick and stuck with jihadis. Killed Americans, but SHE CRIED, so....it's all better..? She found out that not only do they keep the dope for men only and the men like screwing their goats and little girls more than they like adult women. Now she wants to go back to the good life of one night stands and cheap dope. I hope they run a TRAIN on her nightly and junior gets shredded by a JDAM. What’s needed is death squads actively hunting for all people like her.Kill them all. She made her bed that she is now forced to lay in. Should be an eyeopener for some, but I won’t hold my breath. Freedom is a larger thing to give away than most people actually realize, until it is too late. One has to wonder though, if free people made her dream come true would she soon fall into the same trap down the road. My guess is yes. No , they should be tried and executed. They must be exterminated. No more gitmo treatment. If they are not killed on the battefield and happen to be captured they should get a quick military trial and execution. Anyone who fought with ISIS should be burned alive. But I’ll settle for shot on sight. That face has STUPID written all over it. Do you duty, woman. ISIS will assign you a new husband to service. Life is hard, it’s harder when you’re stupid.